Classical theory dictates that we cannot have a system that produces more than what we have to supply. However, that limiting mindset actually doesn’t apply to any natural system in the universe. The very word synergy is commonly used to mean that the outcome of two or more things coming together is actually more than the sum of its parts. Anyone with a financial background understands that they can invest $1 into something and wind up with $2. Those who believe in the Law of Attraction practice the concepts that they believe will give them more than they have to personally contribute. For those that study the bible, there is a principle describing how something can come back to someone 7 fold. Anyone that has planted seeds in the ground knows that the harvest can be many orders of magnitude bigger than our personal efforts. What do these examples have in common? They all violate the “laws of physics” as commonly taught since in each instance, there is more coming back to the initiator or operator of those systems than what they had to personally contribute. Some may argue that physics do not apply to those situations, but there are natural laws, which explain those outcomes that apply 100% to energy producing technologies. The all important distinction is that there is not more going out than in but more going out than we have to put in. That obviously implies that there is extra input from somewhere that is also entering the system, but we did not have to pay for that input. We only invest a small bit in order to leverage natural processes and extra external input or energy can enter the system so that the total amount of results on the output can indeed be greater that what we had to pay for. This is not just a belief; it is an indisputable fact that we have proven time and time again. Since 1977, Thermodynamics has been extended to cover systems that can indeed output more than the operator inputs as long as these systems remain open to external sources of input in addition to our own. This branch of physics is generally known as Open System Thermodynamics or Non-Equilibrium Thermodynamics. These systems are referred to as non-equilibrium systems because if they’re open to free energy input from the environment, this does not prevent entropy but rather it delays entropy, which means that they are prevented from coming into equilibrium so fast. The result is that more work is being done in total compared to what we had to pay for on the input. Every heat pump already works this way – we pay for a bit of electricity to turn a compressor and heat moves for free all by itself towards the cold. The total amount of heat moved in electrical equivelant can easily be hundreds of percent more than the electrical cost to turn the compressor. Another important distinction is to know the difference between efficiency and coefficient of performance (COP). 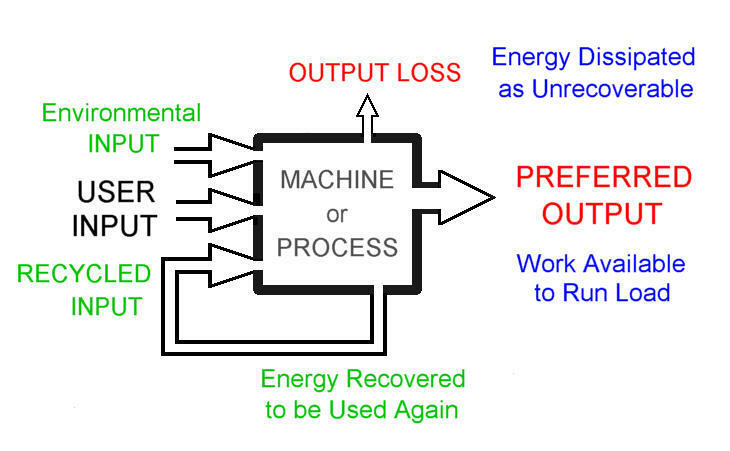 Efficiency is the total output compared to the total input, which includes both our input and free energy input from the environment. COP is the total output compared to only what we have to pay for. Therefore, since there are always losses, the technologies we are sharing with the public are under 100% efficient, but they still can produce more work that what we have to pay for, which is over 1.0 COP. That means there is over 100% more work done than we had to pay for. This is how every natural system in the universe operates and it is surprising that it has been only about 40 years since this distinction has been open pointed out and in fact shows us that the standard closed system thermodynamics isn’t even accurate since all systems are technically open systems. Some open systems are designed to make use of free energy input from the environment and some are not, but they all remain open to environmental source potential. Virtually ever single technology that we aspire to share with the world through the Energy Science & Technology Conference are easily explained and fully permitted by the immutable open system laws of nature and we believe it is the birthright of every human being to understand this truth. ONLY 46 of 150 SEATS AVAILABLE!